RLD is an Akron and surrounding Northeast Ohio mover, but with the help of our relocation partners we can move you anywhere throughout the country. We are proud to be a Prime Agent of Arpin Van Lines. 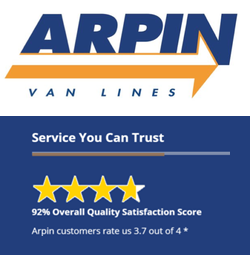 Arpin Van Lines – a top five national van line. Arpin is consistently recognized as an industry leader in quality, safety, on-time performance, and sustainability. Through our partnership we have the support of a nationwide network to help facilitate a long distance or interstate move anywhere in the 50 states.